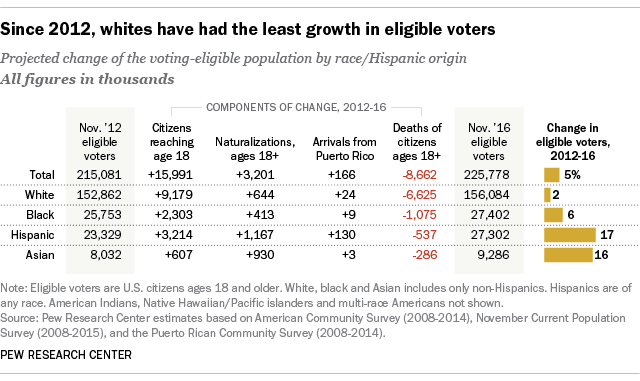 Another reason growth has lagged among non-Hispanic white eligible voters is that they’re underrepresented among young people born in the U.S. who turn 18 – the group most responsible for the nation’s growth in eligible voters. 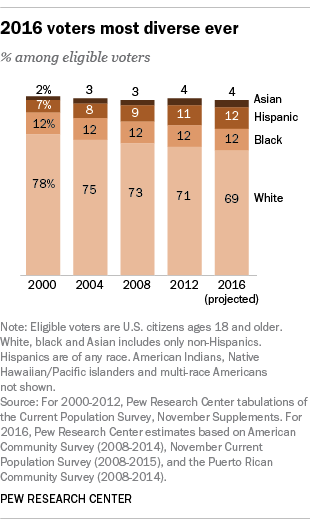 Non-Hispanic whites accounted for 57% of the 16 million new eligible voters who turned 18 between 2012 and 2016. By comparison, racial ethnic minorities – who make up 31% of the electorate – accounted for 43% of new eligible voters born in the U.S. who turned 18.